Alex has to deal with a break-in at the Pub this week and is being interviewed by a police officer. This gives us the opportunity to hear a different style of German, and we’ll also be looking at the verb werden in detail. As usual, Andrea is on hand to explain everything. In this episode of Coffee Break German, the flatmates in our Wohngemeinschaft are organising a party for Carola’s birthday and they’re looking for the perfect location to hold the party. As usual, Andrea is on hand to help Mark and you understand everything in the conversation. In this lesson you’ll listen to the latest instalment of our soap opera in which we get to know a new character, Carola’s friend Hannah. She and Phillip hit it off immediately. Andrea is on hand to help Mark – and you – understand the tricky aspects of the language contained in this episode. In lesson 31 of Coffee Break German Season 2, Andrea and Mark present the first episode of our radio play. You’ll meet the characters Miriam, Carola and Phillip who are sharing a flat together in Munich. Having listened to the radio play you’ll then hear Mark and Andrea talk about the language featured in the episode. Welcome to the 30th lesson in the season and it’s time for some review. You won’t believe how much you’ve learned in lessons 21-29, and in this episode Andrea and Mark will be reviewing topics such as Wechselpräpositionen, relative pronouns, modal verbs, and much more! 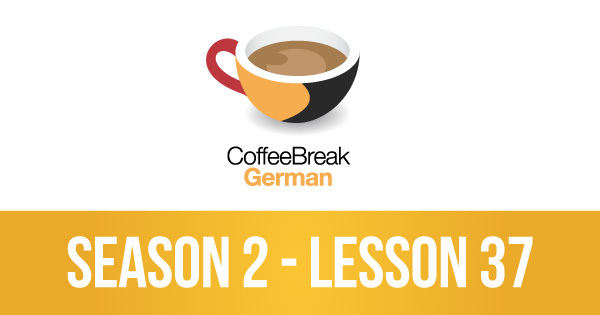 In this lesson we’re tackling a tricky subject for learners of German: word order. In particular we’re looking at where adverbs come “inside the Verbklammer”. For this we’ll be introducing you to a new concept: “Tekamolo”. All will become clear in this lesson. It’s time to look at reflexive verbs in the past. In this lesson you’ll learn to say what you enjoyed, what you complained about and what you looked forward to, and much more besides! Julia is back with a cultural correspondent segment on an area in Italy where German is spoken, Südtirol.